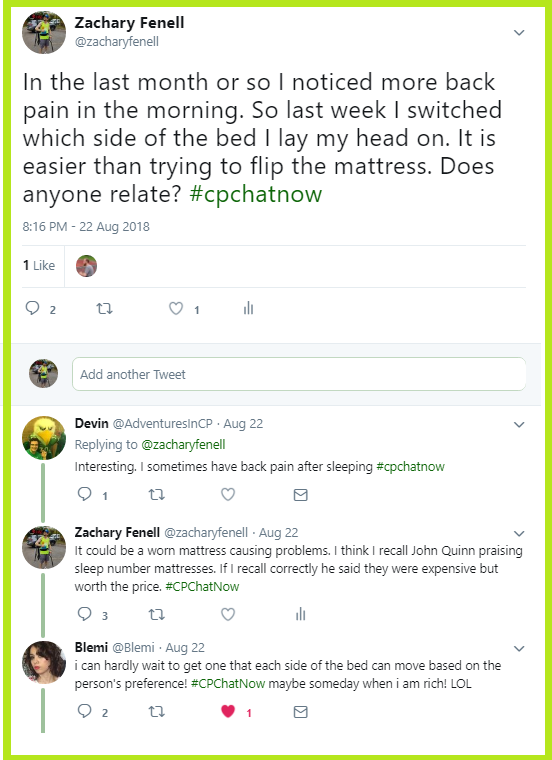 Participants in the weekly cerebral palsy Twitter chat #CPChatNow had much on their minds Wednesday, August 22nd, 2018, a fact apparent by the conversation’s flow. 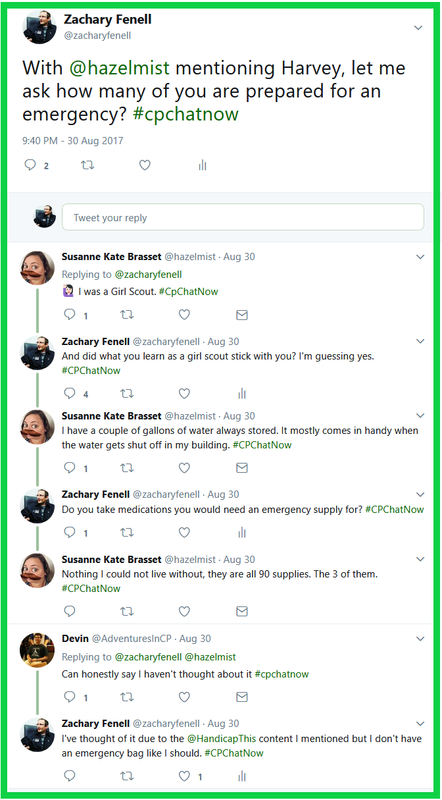 I am co-host Zachary Fenell, tasked to arrange the various topics discussed into one concise recap. A question asked during the previous week’s chat resurfaced sparking early dialogue. New #CPChatNow participant Molly Adamson asked about others’ experiences with able-bodied siblings. Heather DeYoe recalled noticing her disability for the first time when she needed surgery but her sister did not. Meanwhile my answer rerouted the chatter. Blemi and Jen related to my reply. 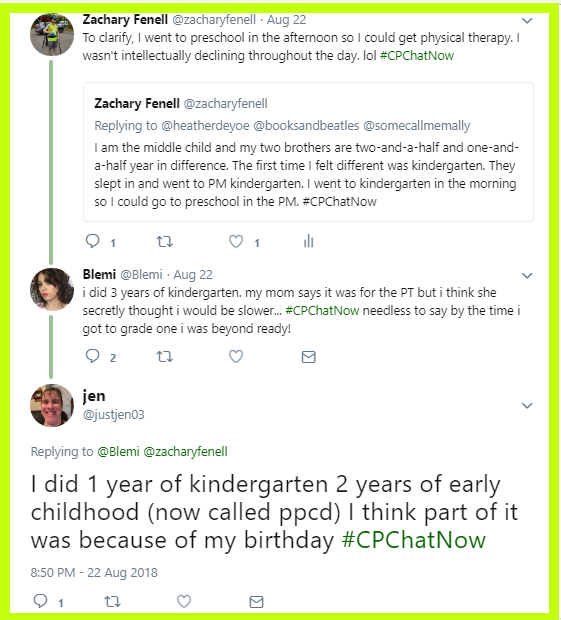 I explained I noticed my CP because I went to AM kindergarten while my two brothers attended PM kindergarten. I attended AM kindergarten so in the afternoon I could go to preschool to receive physical therapy. My third year in preschool! Blemi mentioned spending three years in kindergarten and Jen spent three years between kindergarten and early childhood. All while my brothers enjoyed sleeping in before their PM kindergarten classes! Sleep actually surfaced as another subject matter. Recently I changed how I sleep on my bed because I kept waking up with back pain. Switching where I lay my head proved easier than trying to flip my mattress. My remarks intrigued co-host Devin Axtman who also sometimes has back pain after sleeping. I said a worn mattress could cause those problems but the best mattresses end up costing more money. Blemi anticipated the day she can get a bed where each side can move based on the person’s preference. Later in the chat Devin raised an important issue. 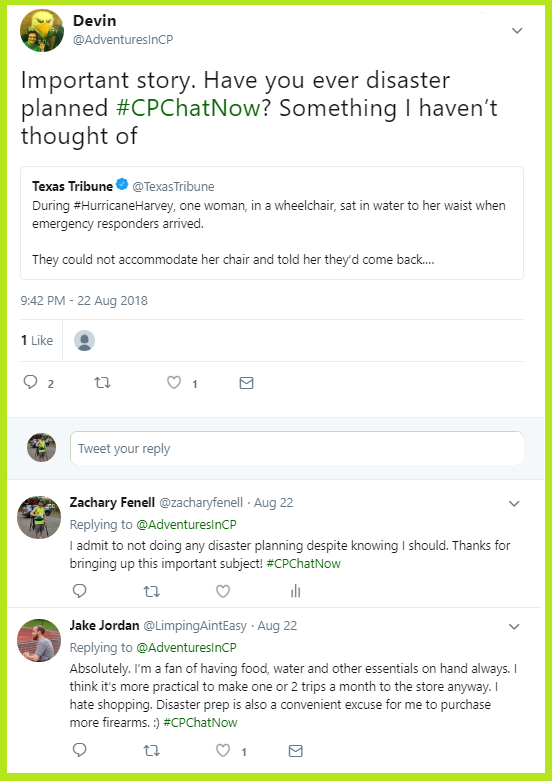 Devin retweeted Texas Tribune’s story covering disaster and emergency preparedness. I admitted to not planning, although I know I should. Knowledge I gained years ago when I connected disability advocate Anita Cameron with Handicap This, leading to a three-part guest blog examining emergency preparedness. You can still read those posts. Unlike Devin and I, participant Jake Jordan said he makes an effort to stay prepared. How about you? If like Devin and myself, due yourself a favor and answer today’s extend-the-conversation question. 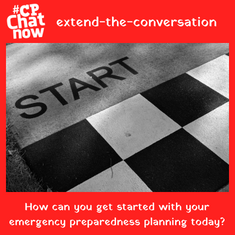 “How can you get started with your emergency preparedness planning today?” Leave your reply in the comments. Make sure to join the conversation on Twitter too! We welcome both new faces like Molly and ones from past #CPChatNows. That includes MIA co-host Jorge Otezia who happened to drop in on the 22nd. Come say hi too, Wednesday at 8pm ET on Twitter. Just use the hashtag in your tweet to enter our community. Or, you can partake by answering the extend-the-conversation questions asked here in the recaps. 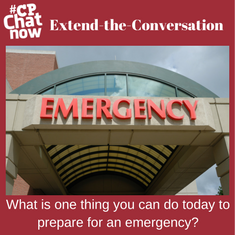 Again, this week’s question asks “How can you get started with your emergency preparedness planning today?” Respond below. Until next time, remember. Don’t blend in. Blend out! 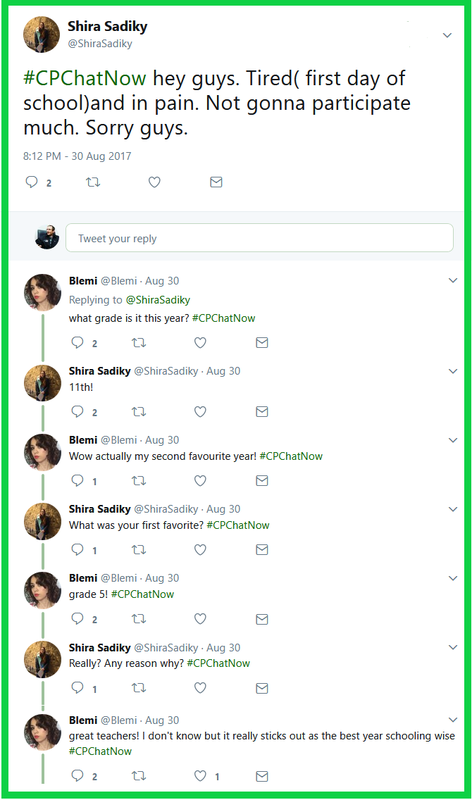 During #CPChatNow Wednesday, August 30th, 2017 participants discussed assorted topics. 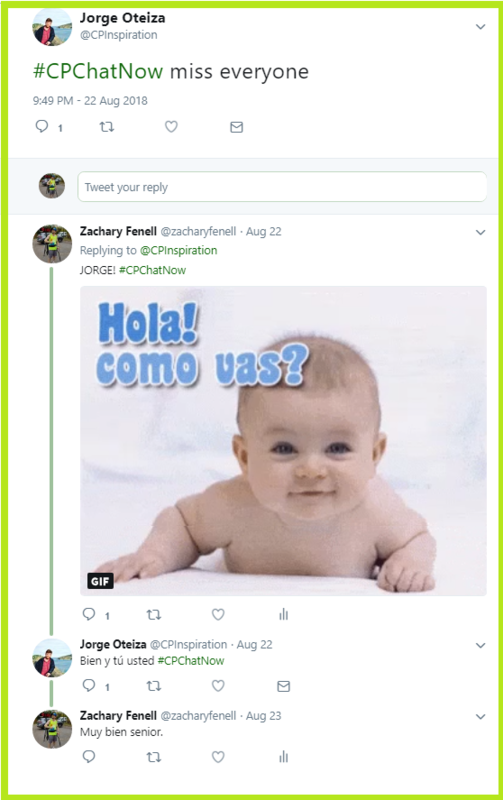 I am co-host Zachary Fenell, here with some highlights. Like usual these come packaged together via the weekly recap. One characteristic which the recaps seem to showcase entails our community’s ability to empathize with each other. 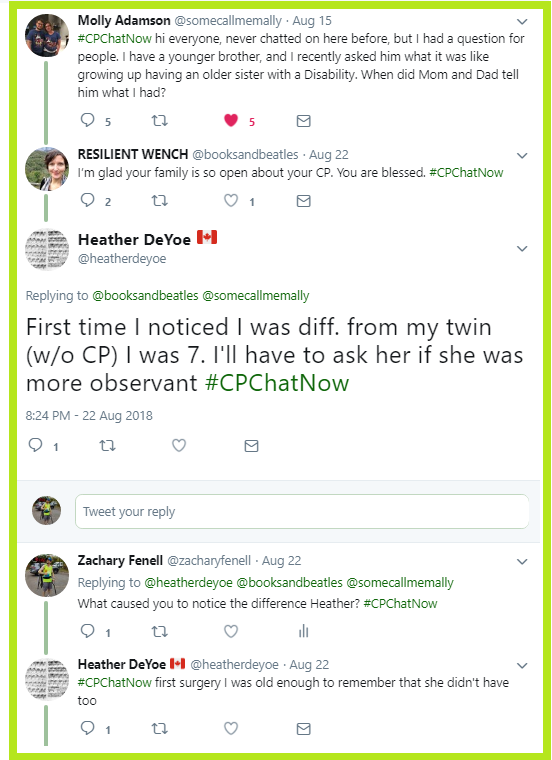 Prior to joining #CPChatNow many never talked to someone else with cerebral palsy before. Chatting with a peer who understands can feel dreamlike. 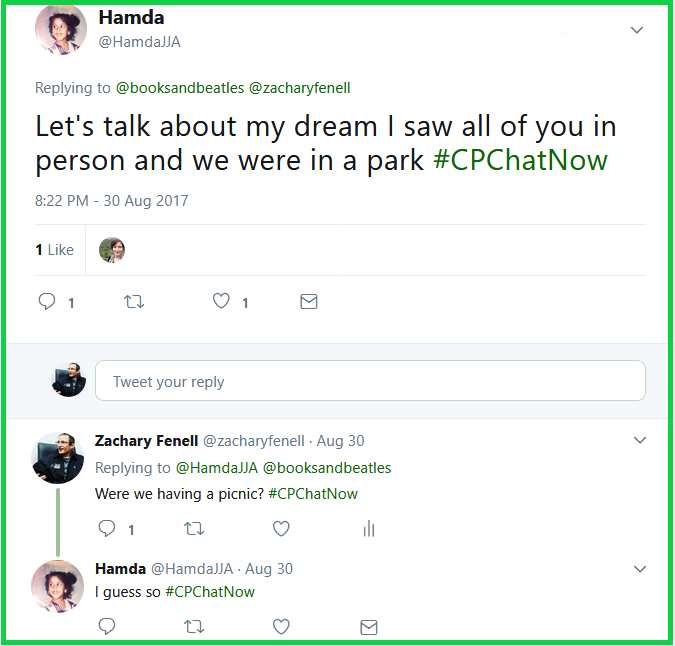 Thanks to regular Hamda, we at #CPChatNow may now credibly boast about our dreamy status. Hamda shared a dream she enjoyed where our community gathered in-person at a park. Such a gathering would prove absolutely wonderful! Arranging said event in reality though requires navigating multiple logistics. Our community remains spread out across the United States and internationally too. Plus we possess busy schedules, especially since school recently started back up for our young adults. Back to school actually generated much dialogue August 30th. Community regular Shira Sadiky mentioned starting back at school earlier that day. This caused Blemi to reflect on her school years. Their conversation expanded with other participants also reminiscing. Eventually the chatter turned to more serious matters, the devastation Hurricane Harvey caused. 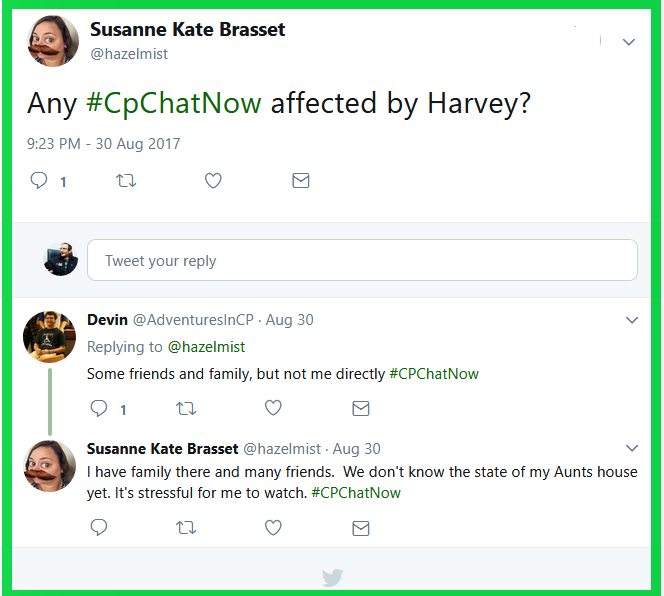 Susanne Kate Brasset asked if Hurricane Harvey impacted anyone in our community. Thankfully nobody experienced direct consequences. However both Susanne and co-host Devin Axtman know friends and family directly effected. Personally I saw the topic as an opportunity to raise an important subject, emergency preparedness. Responses to the emergency preparedness question stood mixed. Susanne’s time with the Girl Scouts left her more than ready in case an emergency surfaces. Meanwhile Devin admitted to never contemplating the matter. I am willing to wager most people’s answers would resemble Devin’s reply. Honestly I only thought about emergency preparedness thanks to a past work assignment. 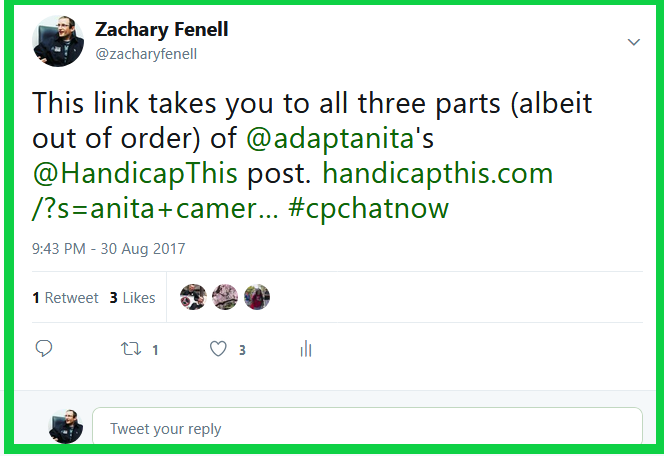 When I worked as Handicap This Productions’ Guest Blog Coordinator I connected them with disability advocate Anita Cameron. Her post became a three-part series detailing step by step how to prepare for an emergency. I highly recommend reading. 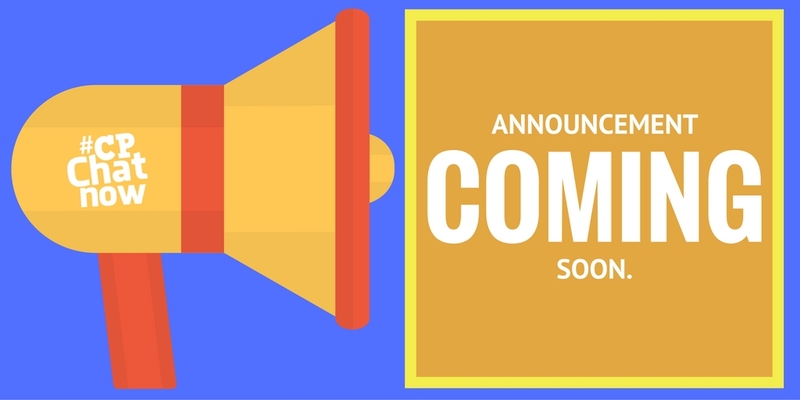 Take a look, “Emergency Preparedness- A Common Sense Measure for the Disability Community.” The read will help you answer the week’s extend-the-conversation question! Respond below in the “Comments.” Thanks for reading. 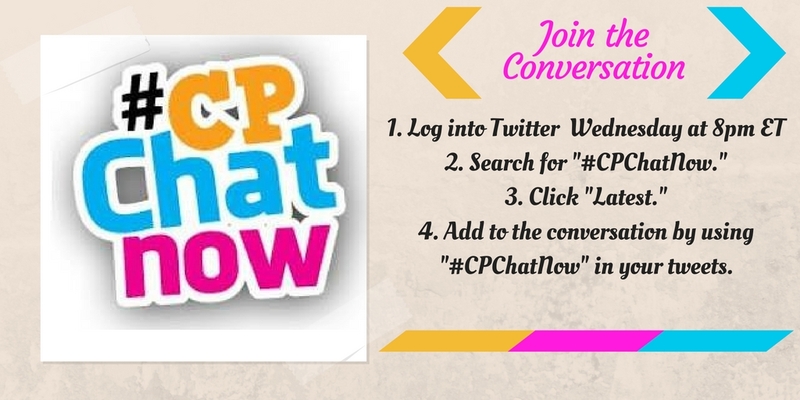 Remember you can partake in #CPChatNow every Wednesday on Twitter starting at 8pm ET. I hope to tweet you soon.